Established in 2002, 888 Poker forms part of the world-renowned 888 Holdings Plc company that operates several online gambling sites, including 888 Casino, 888 Bingo, and 888 Sport. More than two decades after the inception of 888 Poker, the overall brand and outward appearance has evolved tremendously. However, under the surface of the company, the more things have managed to change for the better, the more the company have stayed the same. 888 Poker is considered one of the most popular and oldest online poker sites and is currently the 2nd largest online poker site in the world. The poker site boasts over 1,600 poker players at any given time and over 3,000 players during peak times. The software is completely stable and of high quality, providing several features ranging from hand re-player to multiple in-game settings. Israeli entrepreneurs Aaron and Avi Shaked, as well as Ron Ben and Shay Yitzhak, established the company in 1997. Casino-On-Net was the first online gambling product, followed by Pacific Poker and Reef Club Casino in 2002. Pacific Poker was later rebranded to 888 Poker. In addition to their worldwide reach, the company is also expanding into the regulated market of the U.S. While the main site does not allow U.S players to join, 888 licenses their software to WSOP as well as operates the All American Poker Network. 888 operate regulated sites in New Jersey and Delaware. The site in Delaware has three skins in the state, while the New Jersey site shares WSOP.com player pools. 888 Poker is still one of the most casual online poker sites in the online poker community, provides upfront bonuses that vary between $8 and $88, and is considered one of the softer online poker sites, drawing above-average flop percentages. All of this proves that 888 Poker is one of the most experienced outfits in the online poker community, as they stuck to their guns for more than two decades. Some players tend to stay clear of 888 Poker as they don’t process withdrawals quick enough, have a few questionable exchange rates, and their level of inexperienced poker players have dropped significantly along with the rest of the online poker community. At the same time, players love 888 Poker due to several reasons. The poker site has managed to avoid any major scandals since opening its virtual doors in 2002, still present one of the softest player bases, boast with a fantastic range of excellent promotions, and is the only online poker room to still provide an instant play platform. It’s worth mentioning that 888 Poker is not PokerStars if you’re looking for an alternative poker room. Online poker players who enjoy higher-stakes tournaments, and love playing against professionals, or underfund their online poker accounts to make it relevant to the cash game limits they are more comfortable with will quickly get frustrated with 888 Poker. They are not PokerStars, and we highly doubt they are targeting the same VIP grinders who populate the PokerStars site. Despite what marketing campaigns would have you believe, there is not any one online poker site that is suited for every type of online poker player. Players who are interested in a wide range of cash games more than anything else and those that can easily handle poor poker players will likely find 888 Poker the most comfortable. 888 Poker is packed with great promotions, an arsenal of unique features, a very decent tournament selection, and an excellent quantity of cash games. 888 Poker has travelled a long road since their inception in 2002 as a low-tech afterthought that was essentially a hidden goldmine filled with the worst poker players in the online poker community. They are currently ranked the second largest poker site in the world, offering a complete software package along with an instant play platform, and are the only major player to provide a No deposit bonus. They are ultimately the anti-PokerStars thanks to more casual games and flashy promotions, creating a friendlier environment and more profitable tables. Their promotions are easily one of the best selling points to the site with both No deposit bonuses and generous promotions always available for players to claim. In addition, 888 Poker further impresses with their own unique 888 Poker app, available on any Android or iOS phones or tablets, allowing you to play multi-table tournaments, Sit & Go’s, Snap fast-fold, and regular cash games. The app is responsive, lighting fast, and features huge graphics to get players into the games quite easily. Their multi-table tournaments are probably the only average feature on the site, with only a $120,000 guaranteed tournament available on a Sunday. However, with close to 600 players participating in daily tournaments, it certainly makes up for it. The software is outstanding, and their customer support is extremely friendly, helpful, and well trained to assist you with anything you might need. They also offer a great variety of payment methods, making 888 Poker one of the more well-rounded poker sites that we will gladly recommend to anyone. 888 Poker offers a modern and sophisticated user interface on all available platforms, and uses a blue and black color scheme to portray their poker site. 888 offers a fantastic range of online gambling products, including 888 Bingo, 888 Sport, 888 Casino, and 888 Poker. All their online gambling products can be downloaded directly onto a desktop computer, and Mac users will also be pleased to know that the 888 Poker software operates perfectly on Mac computers. Their poker client can also be accessed through a web browser, thanks to their Instant Play platform, allowing players to join 888 Poker without the need to download any additional software. Players simply need to visit the 888 Poker website through a web browser to gain access to their poker accounts. Furthermore, the poker site offers a marvellous 888 poker mobile app that can either be downloaded on Android through Google Play Store or on any iOS device, including iPhone’s or iPad’s through Apple iStore. Downloading the 888 Poker software client is extremely simplistic and only takes a couple of minutes before you’ll be able to gain access to your poker account via your computer. Below you will find a step-by-step guide to download the poker client directly onto your computer, and the same steps will apply when using a Mac. Ensure you have a stable internet connection and visit www.888poker.com through a web browser such as Google or Firefox. The 888 Poker homepage will instantly be displayed, and there are several links available on the homepage to download the poker software. You can either click on ‘Download’ in the top left corner of the homepage or use the bright yellow ‘Download Now’ button displayed on the top blue banner running across the homepage. You will also find additional download links by scrolling down the page along with a guide to download the poker software. It doesn’t matter which ‘Download’ link you choose to use, all of them will immediately start downloading the installation file that is usually around 646kb in size. Depending on the web browser you use, the installation file will appear in your download folder and takes a few second to complete the download. Once the installation file is downloaded, you can click on the file where it will ask you if you allow 888 Poker software to make changes on your computer. Once you accept the changes, a new box will appear that will ask a range of installation options, such as desktop shortcut, quick launch shortcut, and start menu shortcut. You can also decide where the 888 Poker software needs to be stored on your hard drive. Also, you can choose your preferred language, agree to the terms and conditions, and click on ‘Install’. Once you clicked on ‘Install’, the 888 Poker software will start downloading and depending on your internet speed, it can take a couple of minutes to download the software onto your computer. Once the 888 Poker software is downloaded, you will be prompted to register a new poker account if you haven’t done so already. To register a new account, you will need to provide a variety of personal details, such as first and last name, home address, telephone numbers, and your email address. You will also need to create a secure password that you will use every time you wish to access your account. Once your account is registered, you will receive a welcome email from 888 Poker that will contain your account information as well as the latest promotions and bonuses you qualify for on your account. Once your 888 Poker account is registered, you can make your way to the 888 Poker client on your computer, log in with your registered details and initiate your first deposit by registering your preferred payment method in the Cashier section of the 888 Poker client. Downloading the 888 Poker software onto your Android mobile device or tablet is even easier than downloading the poker client onto your computer. Simply follow the below steps to download the 888 Poker software and play on the move. Firstly, ensure your Android device is updated. After that, you can visit the Google Play Store on your mobile device and search for 888 Poker. Once located, you can select the 888 Poker option and click on ‘Install’. The software will require access to several of your phone features, and you merely need to click on ‘Accept’. The software will take a few seconds to download onto your Android device, and once it’s downloaded, you can open the 888 Poker mobile app, register a new account, and make a deposit to start playing. Downloading the 888 Poker app on your iOS device, including both iPhone and iPad, is very similar to downloading the software on an Android device. However, you will need to visit the Apple App Store to search for the 888 Poker mobile app. Look for the App Store on your iOS device and type in the search bar ‘888 Poker’. Once the 888 Poker mobile app is displayed, click on ‘Get’. You will either need to use your fingerprint to verify that you are downloading the app or enter your Apple passcode before the software can start to download. Once verification has been accepted, the 888 Poker mobile app will download immediately and only takes a few seconds for the poker app to be available. Once the 888 Poker app is downloaded, simply open the app and register a new poker account if you haven’t done so already. 888 Poker has made a solid effort in improving their mobile app over the last couple of years. Initially, their mobile client used to refuse legit players from logging in and gave players frequent glitches that caused players to avoid the mobile client altogether. However, with the recent improvements, it’s become very reliable and stable. Mobile players will be pleased to know that the 888 Poker mobile app will function perfectly on all Android devices, including tablets, as well as any iOS devices such as iPhones and iPads. One of the best advantages when using the 888 Poker app on your iOS or Android device is that everything is playable for real-money. Most poker rooms don’t include Sit & Go’s or tournaments on their mobile clients, but you’ll be pleased to see that 888 Poker has included Classic Poker, BLAST Poker, and Snap Poker. BLAST and Snap poker are prominently featured on mobile devices as they provide fast-paced variations, allowing players to enjoy more poker hands in a much shorter period. Snap Poker will allow you to play between 4 and five hands every minute, making the wait time in a doctor’s office or driving passenger in a car quite profitable. BLAST tournaments are modified Sit & Go tournaments that place all players into an all-in scenario within 4 minutes. They rely heavily on luck but are ideal when you have a couple of minutes to spare. On the Classic Poker side of things, you will find cash games, scheduled tournaments, and Sit & Go tournaments. On the 888 Poker mobile app, you can easily play complete multi-table tournaments while you are active. Although it might not be the most comfortable experience, it will still provide you with the thrill and excitement of playing against other players in a tournament through your phone or tablet as opposed to sitting at home. Just ensure you sitting near a charger as it does reduce your battery life quite quickly. In other words, you can enjoy everything you would enjoy on your Mac or desktop computer straight through your mobile device, and that’s unique from 888 Poker. In addition, players will be surprised to learn that their Instant Play format gives the same experience on the app. Technically speaking, you don’t need to download the 888 Poker mobile app to play on your mobile device. You can simply log in to your poker account and select the instant play option to load the poker client directly through your mobile browser. Once you downloaded the 888 Poker app on your mobile device, you can ditch the desktop version of the software completely. However, it’s worth mentioning that when it comes to making deposits and withdrawals, the cashier section of the app is rather limited. Fortunately, the mobile app allows you to carry out transactions through popular payment methods such as PayPal, Skrill, Neteller, and Credit Card. If you are using a more uncommon payment method, you will need to use the desktop version for the payment to be processed. Although you can play everything on your mobile device, the 888 Poker app does have its limitations. The biggest of which is the lack of multi-table support since there isn’t enough screen space. You also won’t be able to open another app to check your messages or emails as you can on the desktop version. Since players can only have one table open on the mobile app, it’s recommended that you play Snap tournaments or cash games. The fast-fold feature ensures that you are regularly engaged in decision making, so there’s no time to get restless or bored for lack of action. Overall, the mobile app from 888 Poker is sensational on both the instant play format and downloadable mobile app. The mobile version is quick, responsive, and does not have any sluggishness when a decision is made. Deposits and withdrawals are registered immediately through the app, and the overall layout is perfect, whether you play on a smartphone or tablet. The only downside to the app is that you can’t view the entire lobby when it comes to cash games. You will only be able to choose table size and stakes. However, this could be a way to place players faster at tables and prevent experienced players from clustering the tables. The main objective of 888 Poker is to create a casual and fun atmosphere for online poker players while showering them with bonuses and promotional offers to make each feel like a lavished guest. With the high level of promotional offers and bonuses, it can be quite daunting at first to distinguish which offer you’ll be accepting. The first bonus that newly registered players can look forward to is the amazing $88 No deposit bonus. The $88 No deposit bonus can be claimed by simply registering a brand-new poker account and verifying your email address. Sounds too good to be true? Well, in some ways it is, and in another way, it isn’t. An online poker site will not credit $88 in your cash balance for nothing. However, that doesn’t mean that you won’t be able to benefit from this promotion. You will immediately receive $1.00 of unrestricted cash that you can use for whatever you feel like along with 14 x $0.50 in tournament credits that you can also use for any tournament you wish to enter. The remaining $80 is essentially a pending bonus that is unlocked as you play on the tables or enter tournaments. Those that play well have an excellent chance to build their initial free bankroll without the need to make a deposit. 888 Poker also offers a marvellous welcome package to newly registered players once the $88 No deposit bonus has been claimed. The welcome package includes a 100% match bonus up to a maximum of $400 which is considered an above average offer in the online poker community. To unlock the welcome bonus in increments of $10 you will need to earn Bonus Points. These bonus points are accumulated based on what you contribute when playing cash games and or contributing to tournament fees. To unlock $10 of the welcome bonus, you will need to collect 100 Cash Points. After some testing, you will notice that you will receive around $1.00 every hour while playing at $0.50/$1 blinds and around $1.50 every hour while playing $1/$2 blinds. This is yet again quite average in the online poker community. 888 Poker also offers a range of other exciting promotions to keep players coming back for more. Once the No deposit bonus and welcome offer has been claimed, online poker players can also indulge in a unique poker loyalty program and a bunch of cash tournaments that wield some extraordinary cash prizes. The same Bonus Points you accumulate to claim your welcome bonus is used in the 888 Poker Rewards Program. The 888 Poker Rewards Program is very similar to other loyalty tiered reward programs offered by other leading poker sites. The more you play, the more Bonus Points you will earn, and the higher you will climb the ranks to the next status. Every rank comes with a unique set of additional benefits that offer better rewards. The most popular rewards include a merchandise store, freeroll entries, and tournament entries. In addition, you can also use your accumulated Bonus Points to convert them into cash at any given time. This is still a rather scarce feature at other online poker rooms, making 888 Poker stand out even more amongst its competitors. Apart from the 100% match bonus, newly registered players will also receive seven free tickets into the $500 First Depositors tournament. These tournaments are available daily at 19:30 GMT and give you a chance to earn an additional $3,500 on the house. Players will also be awarded two free tickets to the $1,000 Depositors tournament. These tournaments are available twice a week, and every time you make a deposit thereafter, you receive two additional tickets into the $1,000 Depositors tournament. Lastly, players will get an exclusive tournament ticket into the First Depositors Challenge tournament taking place every Friday at 19:00 GMT. The top 10 players will receive a seat in the 888 Poker’s Sunday Challenge tournament. 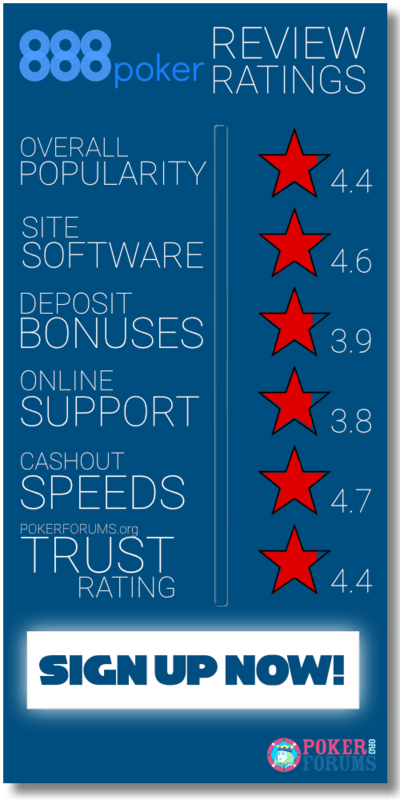 888 Poker’s promotional aspect is certainly one of the highlights when playing in their poker room and deserves a high rating. They are the only reliable poker site that still offers a No deposit bonus of $88 and provides a sensational 100% match on your deposit up to a maximum of $400. Apart from these two offers, you also gain access to several cash tournaments to win even more without having to spend any of your heard-earned money. 888 Poker utilises a proprietary closed poker network that is considered the second largest poker room when it comes to player traffic and will give both newly registered players and existing players plenty of action around the clock on a variety of buy-in levels and cash games. Therefore, it comes as no surprise that their poker software is one of the best in the industry. It’s completely stable and secure, extremely easy to understand, and even easier to navigate with loads of additional tabs to assist both beginner and veteran to find what they are looking for in a matter of seconds. The poker lobby layout uses grey colours to indicate the different tabs that are available at the top, while blue colours are used to indicate what exactly a player is currently looking at. You will find five main tabs at the top of the poker lobby, including Beginners, Quick Seat, All Games, My Favourites, and Play with Friends. For instance, the Beginners tab will provide a list of cash games along with low stakes at $0.01/$0.02 blinds, making it ideal for beginners to get in on the action and to test the software without wasting their money to find their feet in the online poker community. The Quick seat tab will give online players the option to select table type, stake level, and game type, allowing them to join a table directly according to their filter parameters. The All games tab will provide every single poker variation at 888 Poker ranging from Texas Hold’em to Stud. The “My favourites tab” will allow players to add their favourite tables and tournaments to make it more convenient and easier to find the next time they log in. The “Play with Friends” tab will display friends you make at 888 Poker and allow you to join them on the same table when they are online. Unlike other leading poker rooms, you won’t find a large variety of house-built skins that you can use to customize your poker interface. Instead, you can enjoy a smooth, clean graphical layout that makes calling, betting, and folding an absolute breeze. 888 Poker is best known for Snap, a quick-fold iteration that is identical to the original Rush Poker that Full Tilt used to offer. In Snap, every cash game limit will pool all its players to form new tables, keeping players in the action continuously. Once a player decides to fold, they are immediately removed and whisked to a brand-new table filled with other online players who also just decided to fold. The small and big blinds are given to players who have been without them the longest. Snap is a simplistic concept and a genius in execution. It allows players to benefit from lightning fast game speeds of over 200 hands per hour that also eliminates boredom. Winning players also benefit with more wins thanks to the sheer number of hands every hour. A single table in Snap will allow you to enjoy the equivalent of 4 cash games at once. It’s extremely engaging and will allow you to see more action in a shorter space of time. The 888 Poker graphics are filled with neon colours that have lately felt a bit outdated. The table graphics can only be customized in 4 styles, and the software will allow players to choose between several cartoony avatars to assist in breathing life into your gameplay experience. When chatting with other players, you will also notice that when typing LOL, it will automatically update as a smiley instead of the word. This is also a rather nice touch while playing against other players and having a great chat session. When it comes to game customization, you will be surprised at the range of options you’ll have at your disposal. These include the option to show folded cards, how a table should react when it’s your turn to play your hand, a progress bar to indicate your bonus progress that is available at every table, and cheesy sounds that can be used when a player goes all-in. Another interesting aspect of 888 Poker’s software is the fact that you can play Webcam poker. This was once predicted to be the future of online poker, but somehow made a short appearance and fell to the wayside. Luckily, you can still find Webcam poker at this poker room for real money. You will be amazed to see that 6-handed webcam poker tables quickly fill up at the micro limits. Webcam poker basically shows a small screen for every player, streamed from their webcam. The 888 Poker software can be used on your desktop, mobile device, or tablet device. It functions perfectly, regardless of the platform, and provides excellent graphics and crisp sound effects without and lag or interceptions between changing games or placing bets at the tables. The layout is simplistic and very user-friendly. The fact that they have a dedicated tab for beginners is a major plus, allowing novice players to go straight to the lowest tables offered at 888 Poker. What’s even more impressive at 888 Poker is the fact that both beginners and experienced players can use the valuable ‘How to Play’ section on their website. You will find everything you need in terms of how to play, starting with poker strategy, poker hands, poker rules, poker terminology, poker odds calculator, and how each poker variation is played at 888 Poker. In addition, you can also get more information on the different platforms they offer and how to install the software, how to register, how to join a table, and a brilliant FAQ section to assist you in all things poker. This is a fantastic way to get started and is unique when compared to other online poker rooms who simply want you to lose straight off the bat. 888 Poker is all about the game and will do anything to assist you in having a great time. 888 Poker boasts the second highest player traffic in the world and has maintained this record for several years. 888 Poker is only trailing behind the famous PokerStars website. One aspect that is remarkable at 888 Poker is the fact that six seated tables are not as dominant as nine seated tables like you will find at other leading poker rooms, making up around 70% of all the games. 888 Poker is also one of a handful of online poker destinations that frequently draw high-stakes players to their poker room with $10/$20 No Limit Texas Hold’em games being quite active at any given time, along with $100/$200 cash games also occasionally seeing quite a bit of action. You will notice that there are normally ten full cash games at every lower limit tables all the way up to $1.00/$2.00 blinds, and around five full cash tables at table limits above that. Your typical guaranteed tournaments will draw up to 500 players, while Sit & Go tournaments are usually packed up to $10 levels with very little waiting time. The peak hours at 888 Poker are between 18:00 pm and 12:00 am UTC with player traffic above 15,000 players during peak hours where 3,500 online players are usually available on cash games. Low hours are normally between 06:00 am and 09:00 am UTC and will see an average player pool of 2,000 players. The overall tournament selection at 888 Poker is adequate, as its draws a decent amount of traffic to the site, but it’s in no means remarkable. That being said, there are a handful of positive aspects that stand out when looking at the tournament selection. Although it might not line up with your preferences, we usually rank a poker room’s tournament selection through the number of events every hour, how many of the tournaments are add-on/re-buy style, the ratio of guaranteed tournaments, and the variety amongst game variation and buy-in levels. Each of these factors has been met when looking at the tournament selection at 888 Poker. European evenings are the busiest times at 888 Poker, and the number of events is normally 15 to 20 per hour along with daily guarantees between $500 and $15,000. Basically, every tournament will draw around 500 players, which is quite impressive by our standards, and it doesn’t take up a massive time commitment. What we also appreciate is that only 40% of these tournaments are add-on/re-buy eligible, which is an insufferable trend that is being used by most online poker rooms that assist them in boosting their overall prize pool numbers. Rebuys essentially boost the skill-to-luck ratio significantly during the early stages, and aggressive players go all-in and merely rebuy until they eventually get bored of busting out, or simply change and tear the dynamic of the table. There are a range of fantastic guaranteed tournaments available at 888 Poker, including a $3,000 guaranteed tourney for only $0.99, a $5,000 tournament for $4, and a $15,000 tourney for $55 with no rebuys. However, we are quite disappointed with the $200 buy-in Sunday event as it only offers a modest $100,000 guaranteed prize pool. Once during each month, this tournament is increased to $200,000, but the buy-in is also increased to an eye-watering $500. Game variation and buy-in variety is a strength at 888 Poker with typical entry fees ranging from $1 to $5, $22 to $33, and $55 to $160. Players will also be pleased to know that Omaha tournaments are available every hour, along with plenty of deep stacks. You will also find turbo blind speed to makes up 25% of the overall tournament schedule. What’s even more surprising is that you’ll find Snap poker tournaments that allow players the quick fold option, giving them more than 200 hands every hour. The Sit & Go tournaments at 888 Poker have little wait time, and one of our favourites is the 40 seat $1 Sit & Go events that tend to fill up around the clock. Turbo variations and Double or Nothing make up for most of the active Sit & Go tables which are extremely popular up to $10 levels. Players who enjoy Heads-up will occasionally find players at both the $50 and $100 levels. There is no one that will mistake 888 Poker with the massive dominant force that is PokerStars featuring its absurd number of high tournaments. Every serious poker player is going to visit PokerStars thanks to their unmatched high prize pool events. That being said, 888 Poker still has a great selection of tournaments to look forward to, regardless of the fact that their tournament selection is smaller when compared to PokerStars. At the end of the day, 888 Poker is ranked second highest in player traffic, and that means that their tournaments are still drawing hundreds of poker players. The tournament schedule stays incredibly busy with scores of low buy-in tournaments for every casual player, and the time commitment is significantly lower. If the tournaments come second to your regular cash games, they are perfectly adequate. It’s worth noting that every multi-table tournament and Sit & Go can also be accessed on mobile devices. This is extremely useful when you start out on your desktop and wish to complete the tournament in bed or possibly on your sofa should the game run longer than expected. BLAST tournaments are one of the latest additions that is exclusive to 888 Poker. It’s essentially a modified four player Sit & Go tournament that’s been based on a Spin and Go format. They are basically hyper turbo tournaments on a single table with a randomised prize pool. BLAST tournaments at 888 Poker will give 2x prize pool around 55% of the time, 5x prize pool around 40% of the time, 10x prize pool around 4% of the time, 100x prize pool around .004% of the time, and 10,000x prize pool around .001% of the time. The tournaments only feature blind levels of between 2 to 4 minutes, which is extremely short. After the blind levels, the tournament sets all-in on each hand until one player has all the chips. It’s exhilarating, but very luck dependent. The only real skill will come into play during the initial stages when accumulating chips prior to the all-in blast. Another very interesting addition at 888 Poker is Snap tournaments, but it doesn’t seem that these tournaments have quite the attention of the masses yet. What makes Snap tournaments so appealing is the fact that you can go through a multi-table tournament in basically half the time it would normally take you to complete. These will certainly increase in popularity, but for now, they are only attracting around 100 players. 888 Poker has made a huge investment in the WSOP and became the only official sponsor. They even got an event bracelet named after them, known as the $888 Crazy Eights event during 2016. You will notice 888 Poker advertisements integrated on the tables as well as the TV set scaffolding. As the only official affiliate to the WSOP, 888 Poker is the only online poker room allowed to offer direct buy-in satellites as prizes. There are tons of players who are sent to the WSOP by PokerStars, but technically they can’t buy them in, so they simply credit cash into the poker accounts of players. 888 Poker even built a package that every single player receives in the final step. There are packages include a $10,000 buy-in for the Main Event, five nights in a Las Vegas hotel, $1,500 for travel expenses, free entry into the 888 Poker welcome party, and a gift bag filled with gear from 888 Poker. For a chance at the WSOP package, you will be required to play in a direct qualifier with a buy-in of $1,050. You could also buy-in directly, but a limited number of players do it. Instead, it’s recommended that you use the Step system. Step 1 starts at an extremely low buy-in of .01, and for every ten players, a $0.10 buy-in is awarded for Step 2. There is a total of six steps, including the $1,050 buy-in that will award you with the WSOP package. 888 Poker freerolls have reached an all-time high with great opportunities and huge cash prizes available for newly registered players. These freerolls are available to help you build a bigger bankroll without the need to invest any of your own cash. As the most popular and biggest poker site after PokerStars, you will be pleased to know that 888 Poker offers an extremely impressive range of freeroll tournaments as well. The freeroll fields at 888 Poker are significantly softer and much smaller when compared to PokerStars. 888 Poker continues to expand their internet presence as they realised how important social networking is in the modern world. They work hard at gathering followers on both Twitter and Facebook, and those that do follow them via social networking will get access to specific freeroll tournaments. These tournaments range between $750 and $1,000 prize pools, and you will need a password to register for them. The passwords are announced on the social pages prior to the start of each tournament, so expect thousands of registrations. The best way to see the wide selection of freeroll tournaments at 888 Poker is to use the software to arrange them for you. Simply select the ‘Tournaments’ tab in the poker lobby, and then clock on ‘Buy-in’ too soft each tournament according to buy-in. You will notice that freerolls are displayed first and won’t allow you to register for them far in advance. To get more information on the freeroll tournament, you simply need to double-click on it to view the requirements. Don’t forget that Snap tournaments have their very own section in the 888 Poker lobby, so make sure you switch over to locate the $20 Snap freeroll taking place multiple times a day. Players can also look forward to $1,000 Depositors freerolls, and although they require a deposit to qualify, the playing field will be much smaller. The minimum deposit is a mere $10, and you only need to deposit once every seven days to qualify for these freerolls. To qualify for the tournament, your deposit needs to be made between Friday and Thursday, giving you access to 2 Depositors freerolls that occur every Saturday. Although these freeroll tournaments are not available to everyone, it does come with a few perks such as a much smaller field of players. It doesn’t provide the best value, but for a small deposit once a week, especially if you are a small stakes poker player, these are well worth your time and effort. Like most other leading online poker sites, 888 Poker also offers freerolls for several VIP levels. There are multiple levels a player can reach, and the higher the level, the greater the freerolls. VIP freerolls also aren’t available to everyone as you will be required to play a few hands to qualify. Players that do qualify for the freerolls can expect to see $500 freerolls for players at Level 1 taking place daily at 20:00 GMT, Level 5 $50 Omaha freerolls at 17:10 GMT and Level 5 $100 Texas Hold’em freerolls at 11:00 and 20:00 GMT. The Level 10 $200 freerolls also occur twice a day, and the Level 20 $500 freerolls take place daily at 19:10 GMT. There’s also a $1,000 freerolls for those who obtain Level 30, $2,000 freerolls for Level 40 players, $3,0000 freerolls for Level 50, $7,000 freerolls for Level 60, and $10,000 freerolls available for players who achieve Level 70. To qualify for these VIP tournaments, you will need to accumulate 888 Poker Club Points. These can be collected by completing various challenges that include sports bets, casino games, inviting your friends, and so on. The $20 Snap freerolls are considered the easiest to enter at 888 Poker as they are available to everyone and doesn’t require any requirements beforehand. Snap Poker is basically a variation of speed poker at 888, very similar to Zoom poker offered by PokerStars. Players can fold their hands at any given time and simply move to a new table. Therefore, they don’t have to wait for the action to reach them. These Snap freerolls are available several times a day, and although they are packed with online players, it’s still a fantastic way to build your bankroll. Cash games at 888 Poker are the main reason players are flocking to their site. They offer an exceptional range of cash games in a variety of different poker variants. As one of the largest poker rooms in the online poker community, it comes as no surprise that their game selection is well above average. 888 Poker specializes in both Pot Limit Omaha and No Limit Texas Hold’em. You will find plenty of action around the clock up to $3/$6 blinds. You will also find action on Pot Limit Omaha Hi-Lo, as well as Fixed Limit Texas Hold’em. The only poker variant that doesn’t see much action is the Stud they offer on their site, even during peak hours. You will find two, six seated, and nine seated tables at 888 Poker, except with No Limit Hold’em where you can play Heads Up cash games to make the variety of cash games even more interesting. Snap tables at 888 Poker are just as popular and are available in No Limit Texas Hold’em all the way up to $2/$3 blinds, along with a Push or Fold option going all the way up to $5/$10 blinds. Flopomania is the latest addition to the cash game selection at 888 Poker, and instead of using blinds, a maximum of 6 players will use antes. The game removes the pre-flop betting round, and the action starts after the flop. Players can also enjoy Push or Fold Flopomania that will only involve one betting round. You can either bet or fold, and once there are more than two players in a betting round, the five community cards are drawn, and a winner is declared. 888 Poker was initially one of the best-kept secrets in the online poker community. They struggled with poker software that gave them numerous problems for a very long time, stopping plenty of regular players from joining their site to enjoy multi-tabling. They have since resolved all the previous issues, and although the level of players have gotten a lot tougher since everything was resolved, 888 Poker is still considered a much softer online poker site when compared to other leading poker rooms. 888 Poker aggressively markets their poker software around the world through multiple media platforms, resulting in massive amounts of fish, casual gamblers, and recreational players joining their site to play their cash games. There are also plenty of inexperienced players that flow in from their other online gambling products such as 888 Casino, 888 Sport, and 888 Bingo. They have also accommodated an influx of new players by providing a large variety of micro stake tables, meaning that you will always find plenty of fish at 888 Poker to take advantage of. Players from across the globe can easily play for real money at 888 Poker thanks to the assortment of reliable and safe deposit and withdrawal options available. Some of the payment methods offered at 888 Poker are country-specific due to various limitations by several jurisdictions. However, players are bound to find a payment method on their site that will be perfectly suited for all their transactional needs as they boast with 47 different payment methods. 888 Poker further impresses with a secure online environment, using the latest SSL encryption technology to safeguard your transactions from third-party hackers. There’s also an excellent range of deposit options available to players in a specific country, and although they might not be popular worldwide, they offer a great range of benefits to players in their respective countries. These include Chinese debit cards for players situated in China, online bank transfers for players situated in Germany through Deutsche Bank and Commerzbank, bank transfer for players in Singapore, Laser debit cards for players residing in Ireland, and bank transfer, POP, Netpay, PayBox, and eKonto for players in Australia. In addition, players from Italy can use the rechargeable, prepaid cards from Kalibra and Postepay, while players in Ukraine and Russia can deposit through bank transfer. Players in Denmark and Sweden will be familiar with Ewire, while Danes can also utilise Dankort from Skrill. Giropay is another option from Skrill that can be used by German players, and Abaqoos for those situated in Hungary. Boleto is an option available to players in Brazil, while iDeal is perfect for deposits when you are situated in the Netherlands. Przelewy24 is a safe and reliable bank transfer option in Poland as well as P24 that is powered by Skrill. An eVoucher and Print & Pay Voucher known as PayPoint can be used by residence in the United Kingdom, while POLi can be utilised by New Zealanders and Australians for safe and secure deposits. Players in Estonia usually prefer SEB Pank, while Germany and Spain can make use of Sofortbanking/Sofortuberweisung. DineroMail is extremely popular for Latin American players residing in Mexico, Argentina, and Chile, and players situated in Uruguay, Peru, Mexico, Chile, Brazil, and Argentina can deposit through Lobanet, a very popular bank transfer option. Players in Portugal can use online banking or deposit through ATM, while players in Sweden, Austria, Denmark, Finland, Portugal, Italy, Ireland, UK, Spain, and Germany can use PayPal, one of the best options available at 888 Poker. Pay&Play is an exclusive 888 Poker card brand that players can use to deposit in several countries. Players in Uzbekistan, Russia, Moldova, Lithuania, Latvia, Kazakhstan, Georgia, Estonia, Azerbaijan, and Armenia can use Webmoney, Sweden and Finland players can use Nordea by Skrill, and Paysafecard is also another popular option in Europe that players can use. Most of the deposit options available at 888 Poker will allow you to make a minimum deposit of $10. However, there are a handful that will require a minimum deposit of $20, along with Instadebit that requires a minimum deposit of $40. Most of the deposit options are instant, so you can play online poker in a matter of seconds once your deposit has been verified. The uncommon deposit methods might take a little longer, so its best that you first check with support before depositing to ensure you are aware of the waiting period. 888 Poker not only provides a fantastic range of deposit methods but also provides the same variety when it comes to making a withdrawal. The rule of thumb in the withdrawal policy at 888 Poker is to allocate your winnings to the same method you used to make a deposit. When depositing Ewire, ClickandBuy, Moneta, Skrill, Neteller, Webmoney, PayPal, or Visa debit and credit cards, your winnings will be paid to the same payment method. However, if you deposited another method, there are several alternative payment methods that you can use to receive your funds, including bank transfers or cheque. Withdrawal requests at 888 Poker are processed within 3 business days, after you made a cash-in request, except for Gold VIP players who will experience a withdrawal processing time of only one business day. During the waiting period, players are more than welcome to cancel their withdrawal requests and refund the money back into their poker accounts. However, once the withdrawal is processed, this option will no longer be available. Once your withdrawal is processed, you can expect to receive your winnings within 1 to 2 business days if your preferred payment method is either Skrill, Moneta, ClickandBuy, Webmoney, PayPal, or Neteller. If you decided to go with EntroPay, you can expect to receive your funds within 2 to 3 business days, and if you requested your winnings to be paid via debit or credit card, your winnings will reflect within 3 business days. If you decide to receive your funds through a Bank Transfer, you can expect to wait up to 5 working days, and if you wish to receive your funds via regular cheque, it can take between 2 to 3 weeks to receive the funds in the mail. To prevent any fraudulent activity, and to ensure the account belongs to the registered player, 888 Poker will request identification before a withdrawal request will be accepted. Although this might seem unnecessary, it still prevents any third-party from gaining access to your winnings. 888 Poker will require a copy of your Passport, ID, or Driver’s license to confirm your date of birth, and a copy of your utility bill to verify the address registered on your account. They also will request copies of the front and back of your credit or debit card. It’s worth noting that you can cover the CVC number and the middle eight digits of the card before providing this to them. The verification process only occurs on your initial withdrawal, and 888 Poker will not ask for proof of identity again unless your home address changes or other personal information is updated. 888 Poker has a fantastic customer service centre that can be reached through several contact channels when you have a simple query or a request on your online poker account. Their support desk is available twenty-four hours a day and seven days a week and are extremely helpful, friendly, and well trained. The first contact channel is telephone support. 888 Poker is one of the rare online poker rooms that still offer support via telephone. You will notice that most other online poker sites don’t even publish a telephone number to reach them as they purely rely on emails and live chat. However, 888 Poker not only provides a telephone number, but they have also dedicated lines for each major country. This includes Australia, Austria, Brazil, Canada, China, Denmark, Germany, Greece, Hong Kong, Ireland, New Zealand, Norway, Russia, Singapore, Sweden, Switzerland, Taiwan, and the United Kingdom. Secondly, you can reach their stellar support centre through emails. The usual turn around time on emails is around 24 hours. We, therefore, tested the email turn around time at 888 Poker and were surprised to see a reply within 12 hours, half the time it takes other poker rooms to respond to a query. Sending an email can be accomplished on the site, allowing you to choose which department your email is addressed to. 888 Poker also offers live chat. The live chat option is only available when you have trouble making a deposit. Live chat representatives will eagerly await a response when your deposit has declined or when you are looking for an alternative deposit method to fund your account. What really makes 888 Poker unique when it comes to support is their sensational poker guides posted on their site. You will find everything from poker strategy to how to make a deposit. This basically eliminates the need to contact support, unless you have a major issue on your account that cannot be resolved by yourself. In addition, they also have an informative FAQ section that covers the most popular questions that arise when registering a new account. This is extremely helpful when you need a quick answer without the need to wait for support to answer your email or having to pick up the phone to call their support desk. The question that every online poker player will ask is; can I trust 888 Poker? The answer to this question is yes. While a handful of their competitors have run into legal trouble and scandals over the years, 888 Poker has always operated without any major incidents. The company is traded on the London Stock Exchange, and this means that the company must answer to shareholders who will do anything to uphold the reputation of the site as they don’t want their stocks to plummet. 888 Poker is especially dedicated to combat incidents and collusions of multiple accounts. When these violations arise, they are dealt with decisively, and the poker site employs several technicians to protect account information and personal data. 888 Poker also has a solid record when you look at the way in which they pay their players promptly, which is one of the most important aspects of any online poker room. It doesn’t help they offer everything you could hope for and refuse to pay your winnings at the end of your online poker experience. They further impress with a stellar customer support centre and a helpful and informative FAQ section that will answer every single concern you might have before registering a new account. The site is also licensed and regulated by the Gibraltar Gaming Commission, ensuring that every single aspect on the site undergoes regular testing for fairness and trustworthiness. Should I play at 888 Poker? You will have a difficult time to come up with reasons not to play at 888 Poker. They are currently ranked the second highest online poker site regarding player traffic and boast with years of industry experience with no major scandals behind their name. The site offers some of the softest cash games in the industry and provides an arsenal of exciting bonus offers and promotions to keep you coming back for more. Furthermore, they have an excellent range of cash games on multiple poker variants and include a sensational range of tournaments, Sit & Go’s, and freerolls. Their unique Snap poker and BLAST poker offerings is a must for any serious online poker player who enjoys fast-paced action. In addition, you can take advantage of their innovative mobile app offered on both Android and iOS devices, and supports up to 47 different payment methods to easily fund your online poker account. The poker software is stable and extremely reliable, and if you ever experience a problem, you can get in touch with their stellar support centre through multiple contact channels. Overall, you can’t go wrong with 888 Poker, especially if you are someone that loves a great range of cash games. Virtual Holdings Limited was founded by Israeli brothers, namely Aaron and Avi Shaked and Shay and Ron Ben-Yitzhak. The first site they launched was Casino-on-Net. Casino-on-Net launches their poker wing under the Pacific Poker name. The site started off strong, thanks to online players pouring in from their popular online casino product. Pacific Poker receives enormous exposure after sponsoring Dan Harrington who managed to finish in third place at the WSOP main event. 888 Holdings PLC is listed on the London Stock Exchange. At the same time, the company’s marketing efforts shift to the 888 Poker brand. The UIGEA is passed in the U.S, and 888 Poker decides to withdraw from the market along with other leading online poker sites. 888 Poker manages to continue expanding their player base around the world and established a top position in the online poker community. 888 Poker manages to return to the US market and offers their poker product to players residing in New Jersey. Caesars and 888 Poker announce a partnership, making 888 Poker the only online poker room to be an official sponsor of the World Series of Poker. 888 Poker continues to grow its presence in the US and global markets by improving their sponsorships, marketing, and poker software. This lead to the poker site being ranked the second largest poker room in the world when it comes to player traffic. 888 Poker not only offers a well-rounded customer service centre to online poker players but also includes a very informative FAQ section that covers everything from How to Play Poker to their unique Loyalty program. Apart from the FAQ section, players can also browse through their helpful guides on how poker is played and how each poker variant works before you join a cash table. In addition, you will also find 888 Poker’s eMagazine, keeping online poker players informed on the latest developments at 888 Poker, the latest winners at the WSOP, and even more poker guides to improve on your existing skills. You will also find guides to help you make a deposit as well as how to make a successful withdrawal, and all requirements that need to be met before a withdrawal request can be accepted. 888 Casino is a world-renowned online casino established in 1997. This online casino brand utilises several leading software developers, including its very own privately developed software platform from 888 Holdings. 888 Casino offers an enormous selection of top quality casino games along with a wide variety of payment methods, extremely generous bonuses and promotions, and support in multiple languages. 888 Casino is licensed and regulated by the government of Gibraltar. Players can also enjoy 888 Casino on their mobile devices, including iOS and Android. 888 Casino offers a wide range of impressive casino games from multiple software providers, including 888 Holdings, Blueprint Gaming, Elk Studios, Games OS, IGT, Merkur Gaming, and NextGen Gaming. The biggest selection of casino games can be found in their slot collection, ranging from classic 3-reel slots to progressive jackpot slots, filled with special features such as bonus rounds, multipliers, and free spins. The most popular slots include Irish Riches, Zeus III, Kiss, Clash of the Titans, and Victorious. If you are more into table games, you will find a great collection of table and card games to keep you entertained, including 3D roulette, American Roulette, Classic Blackjack, and more. 888 Casino has also added an innovative Live Casino section to provide a realistic and immersive experience at home. These include Live 3 Card Poker, Dream Catcher, Live Blackjack, Live Casino Hold’em, and Live Caribbean Stud Poker. 888 Casino offers three extremely generous welcome packages to take advantage of. These include a standard welcome package of 100% match up to a maximum of $100 along with a Premium welcome package of 100% up to $1,500 spread over your first five deposits. Players can also opt-in to receive the 888 Free Play promotion, giving them $888 in Free Play credits without the need to make a deposit. This is perfect for testing the casino software and browsing through the variety of games to see if you like the game selection they offer before making your initial deposit. 888 Casino are protected by the latest Firewall and SSL encryption technology to ensure you have a secure and safe online gaming experience. This ensures that all financial and personal information is encrypted so that hackers are unable to obtain your information. 888 Casino is also licensed and regulated by the UK Gambling Commission, and certified by eCOGRA that regularly test the software for fairness and randomness. You can find the latest reports on their site by simply clicking on the eCOGRA seal of approval. There are several countries that won’t be accepted at any of the gambling products offered by 888. These include most of the United States, Turkey, Sudan, Syria, Libya, Israel, South Africa, Iraq, Iran, Hong Kong, Indonesia, France, Australia, Guam, Gibraltar, American Samoa, and Afghanistan. 888 Sport features every single betting option you could possibly want. The UK Gambling Commission and the Gibraltar Gaming Authority license and regulate the 888 sportsbooks. You will find everything from future betting to parlays covered at 888 Sport. You will also be pleased to know that 888 Sport offers a live betting, or in-play betting, a feature that can be utilised while the sport event is underway. The range of sports that 888 Sport covers include Soccer, Football, Basketball, Tennis, Horse Racing, Cricket, Golf, Boxing, Cycling, Handball, WWE, Yachting, Surfing, Greyhounds, Politics, Rugby, Snooker, Volleyball, MMA, Baseball, Darts, Ice Hockey, E-Sports, and Motorsports. These markets and betting options are available on mobile as well, making it ideal if you want to place a bet on an upcoming game away from home. Newly registered customers will receive triple their winnings on their initial bet. Players will also receive a $5 casino bonus once their first deposit has been verified that you can use on a range of casino games. The minimum bet at 888 Sport is $5 along with a maximum bet of $10. Players can place a bet on single and straight-line bets on multiple markets. When players make 3 or more in-play bets on any Saturday Premier League, Bundesliga, La Liga, or Scottish Premier League of at least $10, 888 Sport will award an extra $5 free bet that players can use in any in-play game the next day. Place a minimum bet of $5 on a single or multiple bet on odds of 1.5 on any market of your choosing. The larger the price of your winning bet, the higher you will climb on the leaderboard. The leaderboard winner will receive $888, while the remaining nine bettors will get their share of $1,112. The weekly prize pool is $2,000.